2 Red Hens Review & Giveaway! Five Lil Bass in Tow recently had the opportunity to review this beautiful diaper bag from 2 Red Hens ! Look how beautiful these bags are! I am always looking for a new bag and I think I may just add one of these to my Mother’s Day wish list! Make sure to enter for your chance to win your own! Looking for unique?Looking for convertible? (from diaper bag to purse?) 2 Red Hens is the site for you! I love my Pink Lemonade Rooster bag! 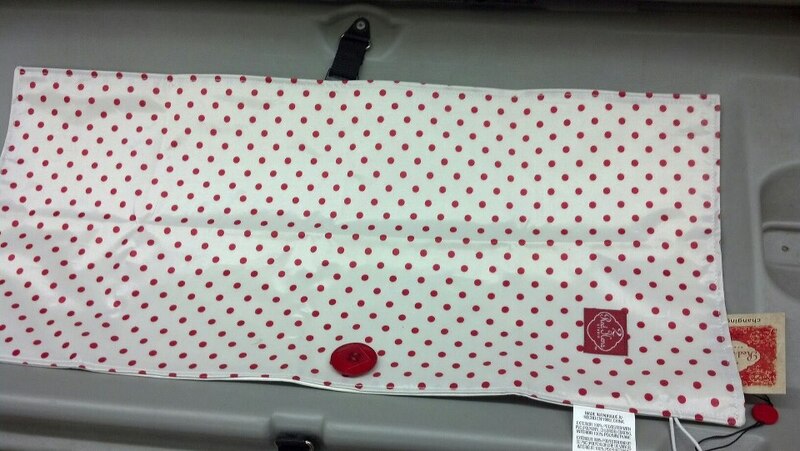 The changing pads are the perfect size for those Walmart changing stations. The straps of the bags are removable with clip links. These are very handy if you don’t want to lose your keys n your bag just clip them on the handle and you are good to go. Bath and Body Works hand sanitizers are also a perfect fit for the handles. The front of the bag has 3 slip pockets. I usually slip my cell phone in the smaller one. keeps in safer than tossing it inside. The inside has a bottle pocket, zipper pocket and 2 small adjustable sleeve pockets. I love that the outside of the bag is made of a water resistant cover. So easy to clean. I have 6 kids in the house so that is a major plus here! I cannot express to you how well this bag is put together. The strap links, the seams the material, all strong and pretty to carry. The straps also make a good teether. The baby loves the straps. I have to constantly take them away from her as the roll it’s in feels good on her gums. I am able to get quite a bit in this bag. I do not close the top. I carry a thick wallet, leather calendar, 3 diapers, a Huggies diaper wipes plastic pack, 6 pens, a small make up bag, a coupon baggie, daughters inhaler, plastic formula holder, a bottle, Nuby toys and a couple other things and it all fits. Nothing hangs out the top. I have been asked numerous times where I got my bag. They have such cute designs. Each Rooster bag with diaper changer runs $50. 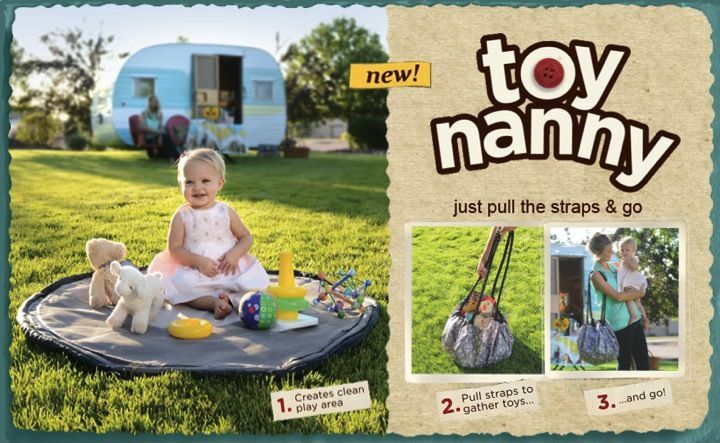 2 Red Hens also carries cart covers and a really neat item called a Toy Nanny. Five Lil Bass In Tow was sent a product to test and post my honest review. This blog is not responsible for prize delivery. Previous Post: « Pampers Kandoo 2-in-1 Shampoo Review! 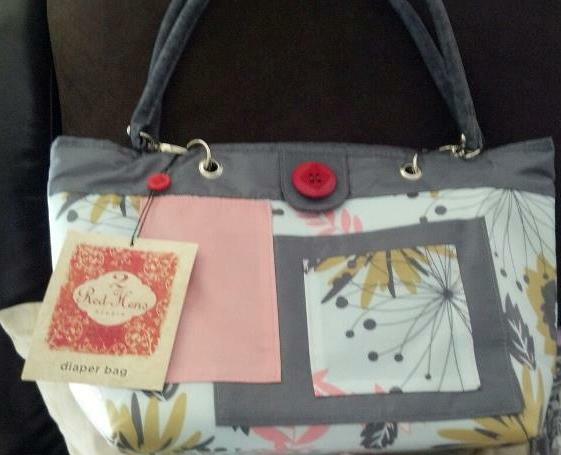 LOVE the Grey Damask Rooster Diaper Bag.